I parked myself on a bistro table and enjoyed a leisurely lunch of a salad, a baguette and an iced tea. I was so happy to be seated outside the European bakery in Santana Row on a gorgeous sunny day like today as I toggled my attention between my Kindle and the people walking by. When I got up shortly before 6 am this morning to prepare for a busy day ahead, the last thing I expected was this. It took some time for me to adjust to the idea that today’s agenda would have to be carried over to tomorrow but eventually I stopped looking at my watch and appreciated this unexpected gift that fell on my lap: time. The water department is doing work on our street to improve our water pressure and very soon our little cul-de-sac will also have its very own fire hydrant. But until then Caterpillars and other heavy machinery will make it difficult to zip in and out of our driveway for errands. So I took with me what I would need for the day, had lunch but with no desire to shop, I spent the better part of the afternoon at my local library. A library, any library, is a haven for me. Where I’m surrounded by books I feel at home. The one that sits just two miles from my home was rebuilt a few years ago and now it looks like a massive cabin with high ceilings, wood beams, floor-to-ceiling windows and lots of open space surrounding it. I have my favorite spot at the far corner of the library; cozy and quiet with a comfortable chair and table, it gives me a perfect unobstructed view of the world outside. Today I watched kids play on the lawn–actually playing the way kids used to in my time–chasing each other, imitating airplane and firetruck sounds, hiding behind the bushes and wrestling instead of being glued to a smartphone, an iPad or the television. It was so refreshing to witness them being carefree. It helped me to seize the moment myself instead of worrying about the tasks I wasn’t completing. 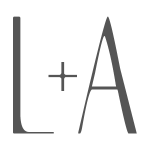 I leafed through some design magazines and a few cooking publications. I watched the vendors at the parking lot set up their stalls for the Thursday afternoon farmers market. I also managed to edit these pictures so I can share this delightful cake. Wasn’t it just last week that I complained about not being able to bake a sweet treat with cherries? Last Sunday was my lucky day, apparently. 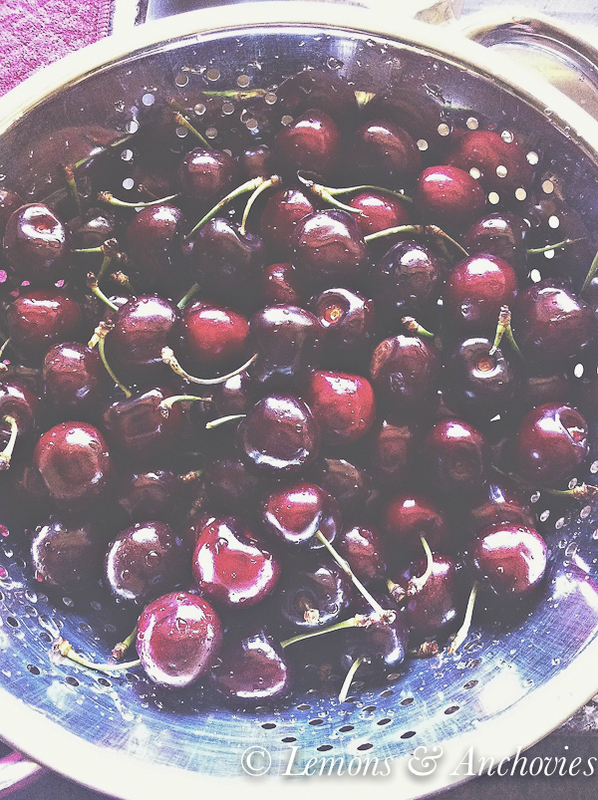 I arrived home with a couple of pounds of cherries and no cherry-thief husband in sight. I knew his bike ride would take at least two hours, enough time to whip up a cake before I’m once again left with only a bowl of cherry stems and pits. With no recipe in hand, I turned to the always-reliable Joy of Baking site for inspiration. This cake is what my husband came home to after his bike ride. Given that he recently told me he’s not a big fan of cherries I was tempted not to offer him any at all but my mother raised me better than that. I’m sure that he agreed to taste it just to be polite but one bite soon turned into a wedge and by the time the day was over only a small portion was left. I’ll be honest and say that cherry desserts have never been my favorite either but this recipe has changed all that. 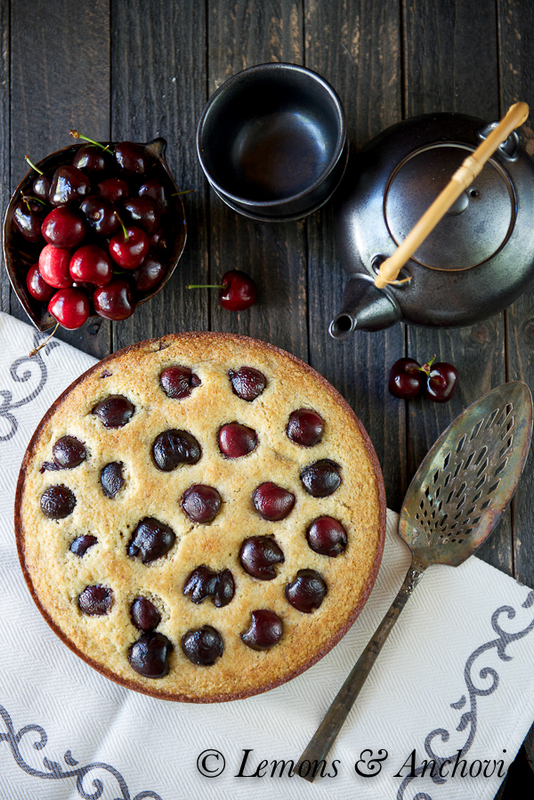 Cherries and almonds make a great team in this light, spongy cake. I upped the almond flavor just a little from the original recipe and made no significant changes besides that. A keeper. That’s what this cherry-almond cake is and it was the only thing missing from this otherwise perfectly relaxing day. 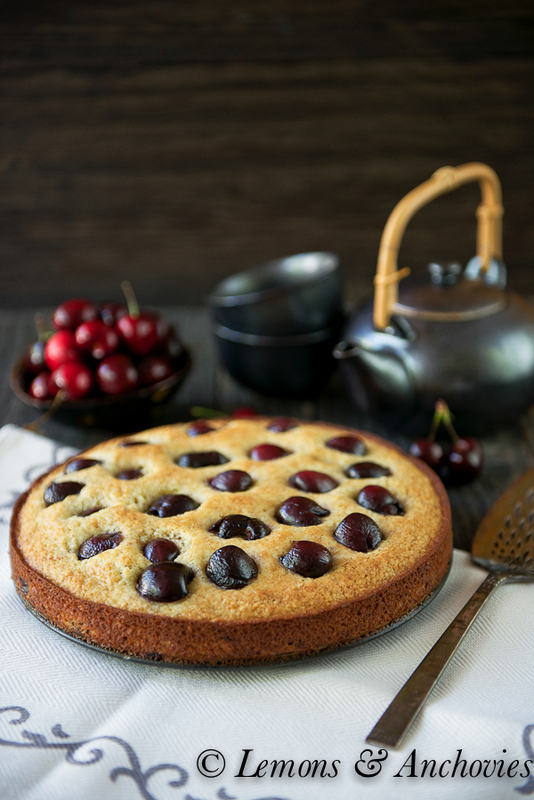 Enjoy cherry season with this simple cake. 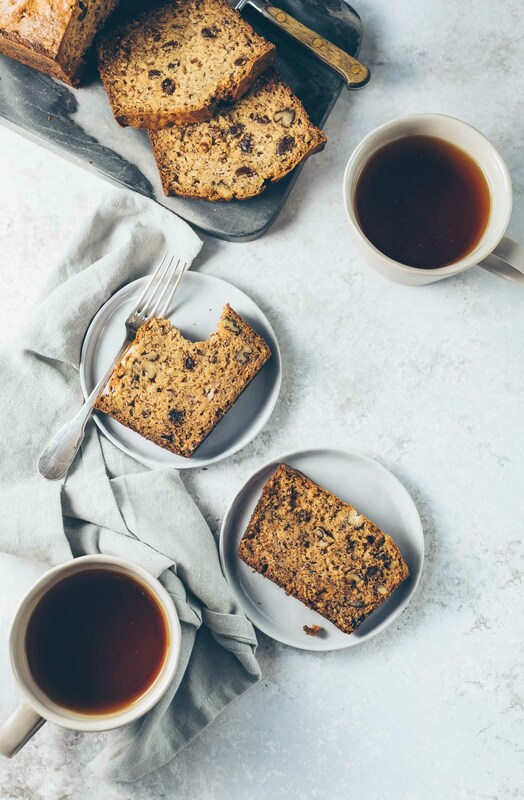 You will want to have it for breakfast, afternoon tea or dessert. Preheat your oven to 400℉ and butter a 9-inch spring form pan and line the bottom with parchment paper. Melt the butter on the stove or in a microwave and set it aside to cool to room temperature. Take 12-14 of the cherries (about ⅓), cut them in half and set them aside. These will be placed on top of the cake during baking. Cut the rest of the cherries into quarters to be folded into the cake batter. In a separate bowl whisk together the flour, almond meal, baking powder and salt. In another bowl, beat the eggs and sugar until thick and light colored using a hand mixer; this will take about 3 minutes. Beat in the almond extract next then fold in the cooled butter and milk with a rubber spatula just until everything's incorporated. Fold in the flour mixture then gently fold in the quartered cherries (not the cherries that you have halved for the top of the cake). Pour the batter into the prepared pan, smoothing the top with a spatula. Bake for 12-15 minutes then remove from oven. Quickly arrange the remaining cherries, cut side down, on the top of the cake. Return the cake to the oven and bake for a further 12-15 minutes or until golden brown and a toothpick inserted into the cake comes out clean. If you find the cake browning too quickly, cover it with a piece of aluminum foil. Remove the cake from oven and place it on a wire rack to cool slightly (about 10-15 minutes). Serve warm or at room temperature. From Joy of Baking Cherry Cake with just minor tweaks. Picture perfect cake ! Drop dead gorgeous slices ! I almost had a heart attack seeing those BEAUTIFUL pictures ! This is so gorgeous, almost too pretty to eat. Good thing we’re not neighbors; either your cherries would have been missing when you got ready to bake or this would have had a generous slice removed when you came back to do your photo shoot 🙂 …………….. not mentioning any names or anything like that. Oh, Jean… you’ve just described the perfect day!! I also love the library. I love a book, a real book. My husband laughs at me and insists that the kindle is far preferable and a “smarter” choice. Give me a book any day though, and I’m happier. My son feels the same. And the cake? Yep… that’s my kinds of cake too. No sweet frosting, just the almond flavor and cherries. I’d love a piece with a good book!! This is a dreamy little cake, one I could get behind right now and eat half of it without stopping!! I need a self imposed relaxing day…yours sounds heavenly! And your cake looks fantastic…the cherries I’ve sampled this season have been outstanding. I’m certain your cake was, too. 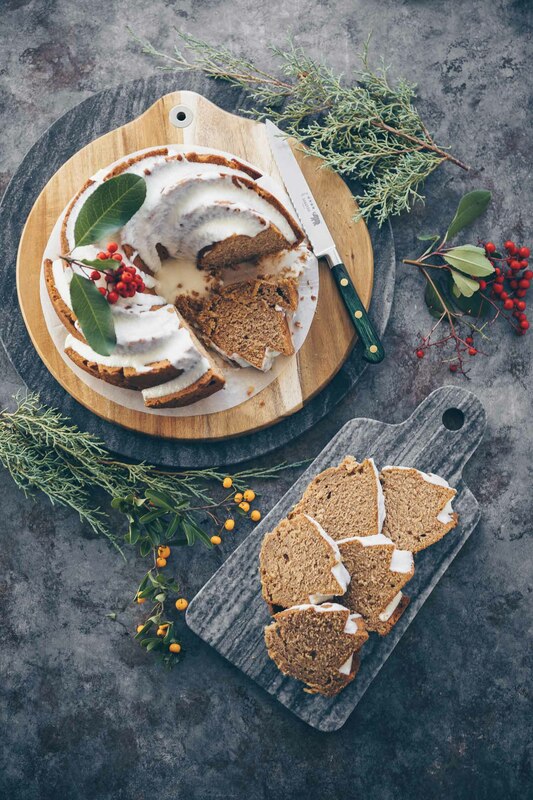 I love the filter you used on some of these photos – perfect mood for a rustic cake! 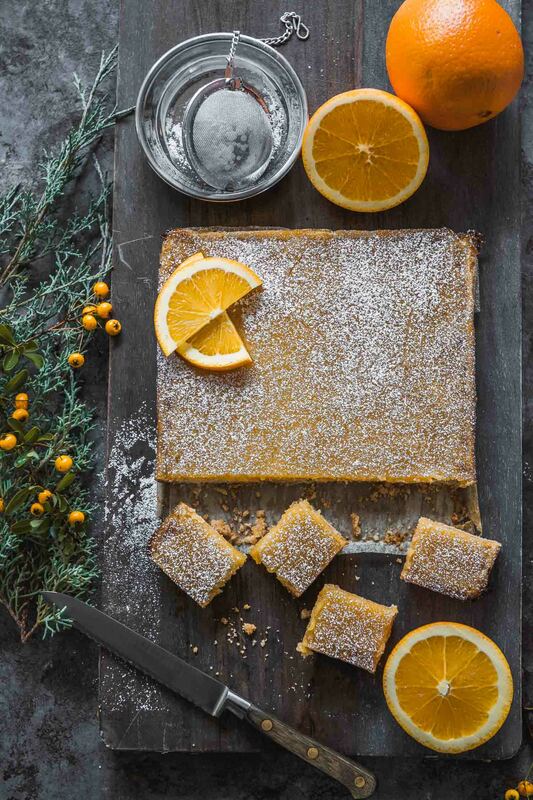 Speaking of cake, I’m bookmarking this recipe! It’s exquisite, and I’m a fan of Joy of Baking! What a beautiful cake. Cherries and almonds go so well together! Love Santana Row! I can just imagine that you were in heaven down there. Cool to hear that your water pressure is improving but I am sure the noise is something you all can live without. This cake looks and sounds AMAZING. I remember seeing the photos on instagram and looking forward to your post! Have a great weekend! I luv cakes like this with fruit and a sort of rusticness about it. Really beautiful, Jean…on my list to try! Cherries 😉 This post is perfect berry love to me! I would do a hundred bike rides if I had that waiting for me!!!! 🙂 This cake sounds fantastic! I am all about cherries right now! And gosh girl, your photos always make me fall in love with whatever you make. I have never actually baked with cherries before. Last year was he first time I actually enjoyed eating them, up until then I didn’t even enjoy that. Hoping to take advantage and try a few recipes this year. This cake looks like it might make the list! This looks amazing – thanks for the recipe. I am the same – I love libraries too and have a long unfulfilled ambition to be a librarian. Also, I was going to make this today but woe, there are no cherries at my supermarket. I will have to wait. This does not make me happy. Beautiful! 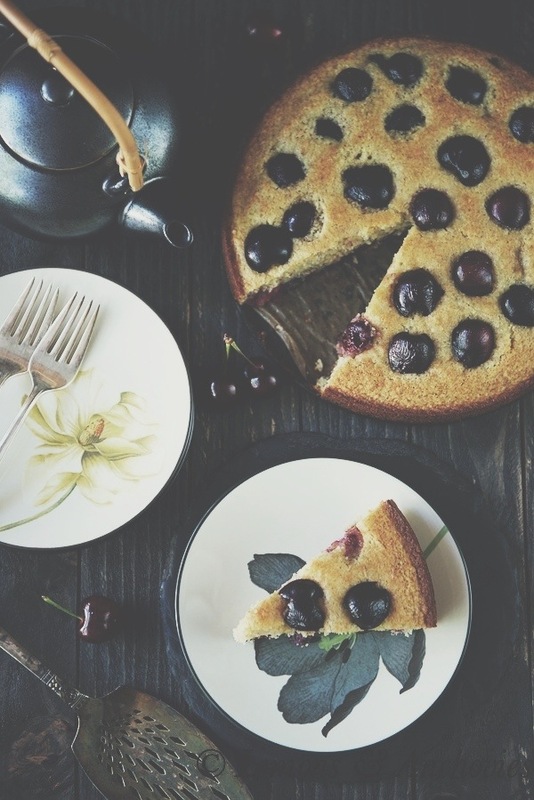 We have a Cherry Clafoutis coming up for FFwD and I hope it turns out half as lovely as your cherry almond cake! Jean, I tried this very same recipe from the same site last year! Yes, I agree, it’s definitely a keeper. 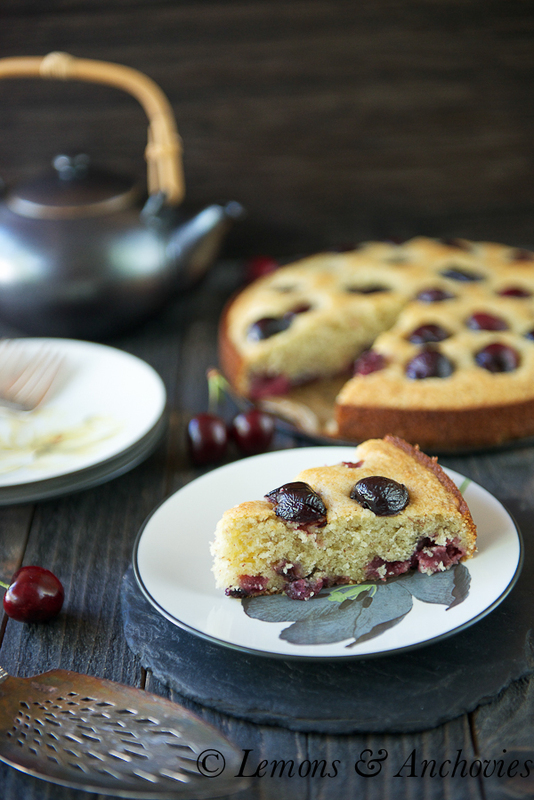 I added a splash of cherry-flavoured liqueur – kirsch – to my cake. It came out nice and boozy and moist! Loved it! This cake was so light and moist, not at all soggy- I varied it slightly, spread frozen cherries across the base of the pan before making the batter rather than mixed them in, and served it upside down with a thick layer of crumbled almond meringue (bit sticky not too dry) scattered over the top. Splash of kirsch in both cake and meringue. Because I doubled the quantities for a large tin it did take about an hour to bake, and did need a piece of loose baking paper popped on top half way through baking as you suggested. Looked glam and tasted yum! Thank you! Well worth repeating. Becky, I love what you’ve done in your version. I’ll have to try it your way sometime. The kirsch was a nice touch. Thanks so much for trying out this recipe! !